- Creates a well ordered border and provides ample support for heavy plants, flowers and shrubbery. - The garden green color blends well with the plants and doesn't stand out. - An effective way to corral plants and provide an aesthetic appeal to your garden. - Particularly ideal for bushy plants like peonies and daisies. - A perfect solution to prevent plants with heavier and larger flowers from covering or draping over smaller plants nearby. - Great for keeping pathways open. - Designed to install easily - just push into the ground. - A 15 inch (38 cm) long, robust and sturdy support. - Stands 30 inch (76 cm) tall and is made from durable and long lasting rust and UV resistant coated solid metal wire. 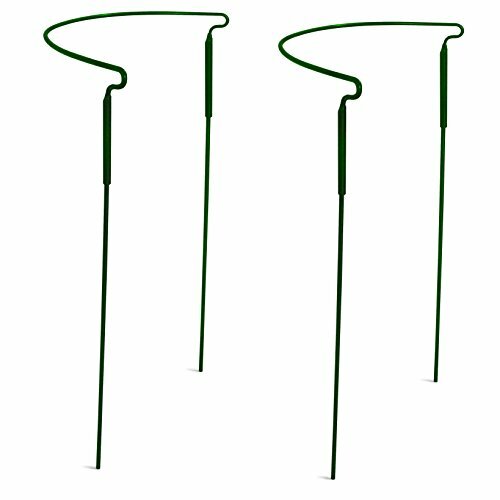 - The weather proof metal support assists your plants to grow upright and works better than wood. - If you'd like your money back at any time within 90 days of your purchase, no worries. Just ask. AESTHETIC: The GrayBunny semicircular pant support creates a well ordered border and provides ample support for heavy plants, flowers and shrubbery. The garden green color blends well with the plants and doesn't stand out. An effective way to corral plants and provide an aesthetic appeal to your garden. EFFECTIVE: Particularly ideal for bushy plants like peonies and daisies. A perfect solution to prevent plants with heavier and larger flowers from covering or draping over smaller plants nearby. Also great for keeping pathways open. PREMIUM QUALITY: A 15 inch (38 cm) long, robust and sturdy support. Stands 30 inch (76 cm) tall and is made from durable and long lasting rust and UV resistant coated solid metal wire. The weather proof metal support assists your plants to grow upright and works better than wood. EASY INSTALLATION: Designed to install easily - just push into the ground. Disassembles for storage. GUARANTEE: GrayBunny offers premium products for your home and garden while exceeding highest industry standards and offering impeccable customer care. If you'd like your money at any time within 90 days of purchase, just ask. Click the "Add to cart" button on the above right to adorn your outdoor living space now!